About Alana Apfel: I am a doula, writer and birth activist currently living in the UK. In Bristol where I live I am part of a collective of doulas offering sliding scale community birth work. I recently moved from California where I was part of the San Francisco General Doula Program and the Birthways center. Both programs provide volunteer doulas for people without means to pay. As an activist writer I gathered stories from doulas working within these organisations as well as the Bay Area Doula Project, BirthKeepers, Birth Justice Project and SQUAT. These contributions are featured in my forthcoming book Birth Work as Care Work: Stories from Activist Birth Communities published by PM Press in Spring of next year. More info can be found here. I was brought up by a family of healers, health activists and a mother who was a midwife. I was her fourth child born at home. I have always been taught that birthing women and others who give birth are strong powerful beings who are fully capable of doing so in their own way and on their own terms. This is never something I have doubted. This conviction directly shapes my doula practice today. The wonder of giving birth and supporting others through birth has always been with me. It is my legacy and my life’s passion. Radical birth work for me begins with the recognition that birth, and actually all reproductive processes, are both deeply personal and highly politicised events. We cannot separete the “personal” from the “political” in birth. How we birth, and how we support others through birth, is a direct reflection of society’s politics. Radical birth work also requires confronting systems of privilege that run throughout society. Some continue to benefit whilst others continue to be harmed. What is unique about doulas in this case, is that while we work (most often) within hospitals, we work for ourselves. This enables us to bring a degree of institutional critique to our practice. From this position birth workers avoid being “medicalized” leaving us with the potential to confront and redress institutional forms of violence that are inflicted upon reproductive and birthing bodies. 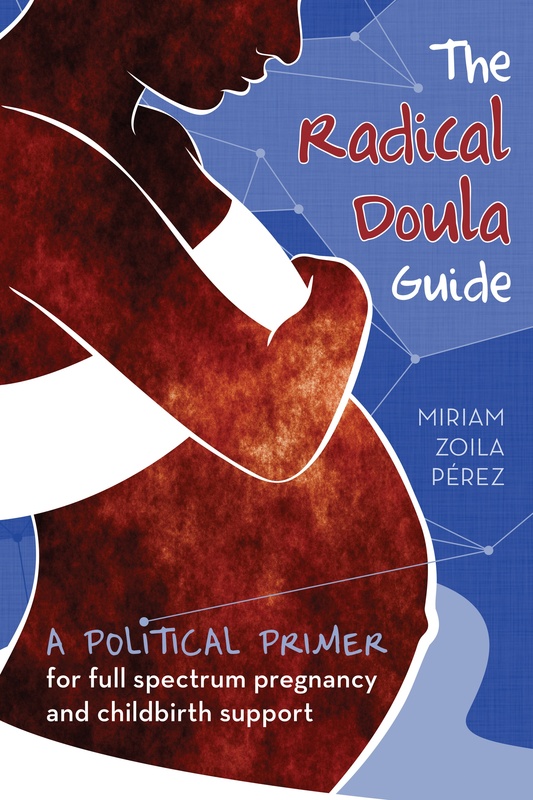 A radical doula is a caregiver whose activism holds the ability to literally reimagine lifes beginnings. I recognise no “correct” way to give birth instead honoring the unique rhythms of each birth giver as they move through their own birthing process. Regardless of where or how you give birth – home, hospital, vaginal or c-section – every birth signifies a beautiful occurrence. Every birth giver and every kind of birth outcome deserves loving support and respect. My sense is that we need to broaden the nature and language of care to incorporate a greater diversity of reproductive needs. Not everyone experiences their sexual and reproductive bodies in the same way. To subsume all birth givers within the same form of reproductive care is to erase individual identities and lived experiences. Birth workers hold space for others to discover their own inner potential, helping to facilitate, but never take charge of, the trials, joys and beauty that come from navigating one’s own reproductive journey. Witnessing the immense, surreal and mystical power of all birth givers as they move through their own birth journey and emerge triumphant to hold the children they carried, nurtured and brought into this world, for the first time. One problem with healthcare today is the framing of reproductive experiences as a matter of “choice.” This framework promotes a belief that the individual has full agency in decision making over their health whilst overlooking, and therefore masking, intersections of race, gender, sexuality, physical ability, citizenship and economics that differentially affect health outcomes and determine the quality and extent of care that is given. Economically disadvantaged communities, communities of colour, queer and gender nonconforming communities, in particular, bear the brunt of institutional forms of violence. Breaking cycles of oppression means directly engaging these systems in order to reimagine a language of birth that creates room for all birth givers to feel heard, affirmed and respected. I fixed the link, thanks Andrea!